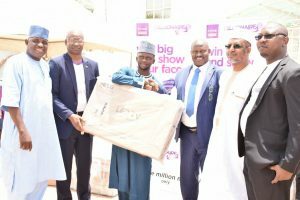 First City Monument Bank (FCMB) has rewarded another set of 644 lucky customers in its ongoing reward scheme, tagged ‘’FCMB Millionaire Promo Season 5”. The second set of winners emerged at the second draws of the promo held across Nigeria on Wednesday, July 25, 2018. This brings to a total 1,288 customers of the Bank who have so far won cash and other gifts since the promotions commenced in March this year. The FCMB Millionaire Promo Season 5, which runs till November this year, is an extension of the Bank’s previous promotions. It is designed to give extra value and reward to our customers, while encouraging financial inclusion and savings culture in the country. The promo is targeted at all segments of the society, especially existing and potential savings account customers of the Bank. This however, excludes salary and domiciliary account holders. While four lucky customers won N1million each, a total of 640 other account holders smiled home with LED television sets, generating sets, decoders, tablets, smart phones and other consolation prizes, at the end of the electronic selection exercise. At the Lagos Regional draw held at Gbagada, a suburb in the State, Mercy Ailekhue was the lucky winner of N1million, while Hulera Zubairu won the same amount at the Abuja & North Regional draw which took place in Kano. The third N1million winner, Ukwuaba Aliu, came from the South-East/South-South Regional draw held in Port Harcourt, Rivers State, just as Williams Rotimi was also rewarded with N1million at the South-west Regional draw in Ijebu-Ode, Ogun state speaking on the promo draws, FCMB’s Executive Director, Retail Banking, Mr. Olu Akanmu, said, ‘’We are excited that more of our customers have continued to be rewarded and empowered through this exciting reward scheme. We are committed to impacting the lives of individuals and businesses by delivering valued-added products and quality service that translate to exceptional customer experience. Our existing and potential customers are encouraged to partake in the FCMB Millionaire Promo, because it is an avenue to turn dreams to reality’’. On how to participate, Mr. Akanmu, explained that all an existing or a new customer of the Bank has to do is to increase his or her balance by N10,000.00 in any of the eligible savings account and maintain it for 30 days to qualify for the Zonal and Regional electronic selection of winners where the star prize of N1million and other fantastic prizes will be won. Multiple savings of N10,000.00 will increase the probability of winning. To qualify for the grand finale draws in November 2018, where four customers will each win N2million, existing and new customers are to increase their balances up to N50,000.00 and maintain them for 30 days. Multiple savings of N50,000.00 will also increase the chances of winning. The third draws of the promo will hold in September and the grand finale is in November. First City Monument Bank (FCMB) Limited is a member of FCMB Group Plc, which is one of the leading financial services institutions in Nigeria with subsidiaries that are market leaders in their respective segments. Having successfully transformed to a retail and commercial banking-led group, FCMB expects to continue to distinguish itself by delivering exceptional services, while enhancing the growth and achievement of the personal and business aspirations of its customers. London, United Kingdom – 26th June, 2018 Individuals and Business Enterprises who seek to transact their banking services between Nigeria or other African countries and who desire to maintain a banking relationship in the City of London now have the opportunity to do so. 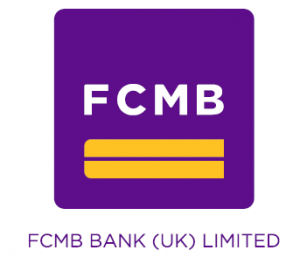 FCMB Bank (UK) Limited recently obtained a variation of its banking permission to include retail (investments) services. The permission was granted by the Prudential Regulation Authority and became effective on the 8th of June 2018. Based on this approval, FCMB Bank (UK) Limited is now able to extend the level of excellent banking services its Corporate and Institutional Customers currently receive to High Net Worth Individuals (HNWI) and Small and Medium Business Enterprises. “Our successful UK platform has proven to be of great importance to the Nigeria stockbroking and international trade finance activities of FCMB Group. Leveraging our deep networks in Africa’s biggest economy, the importance of a London presence to many of our Personal and Business banking customers, and technological innovation, we welcome this opportunity to meaningfully serve more of our customers and grow the value of our UK franchise.” The Bank has completed arrangements to formally launch its Personal and Business Banking proposition on the 19th July, 2018 in London and subsequently on 31st July, 2018 in Lagos. “As a customer-centric business, both events will enable the Bank to meet with prospective customers, share the Bank’s Personal and Business Banking proposition and obtain first-hand feedback on their banking needs and requirements”. Operating in the City of London, FCMB Bank (UK) Limited is a UK incorporated bank and a wholly-owned subsidiary of First City Monument Bank Ltd (FCMB), a member of the FCMB Group PLC (Nigeria). FCMB Bank (UK) Limited began its operations as a BIPRU €50k investment firm in September 2009 with its CSL Stockbrokers division providing the services of “receiving and transmitting” institutional client orders for Nigerian listed securities. Subsequent to the variation of its permission on the 27th September 2013, the bank commenced wholesale deposit taking activities, offering a wide range of products including foreign exchange, treasury, corporate banking and trade finance services to corporate and institutional customers. With the bank’s Retail permission approval, the bank’s customers now include individuals and business enterprises. Leading financial services provider, First City Monument Bank (FCMB), has unveiled a scheme tagged, ‘’FCMB Education Advisory Service’’, that would ensure convenient and affordable education support for its customers who or their children desire to study abroad and obtain undergraduate and post-graduate degrees. The support includes overseas admission information services, school fees remittance, school living allowances and travel fares, loans to support school fees payments, visa process, travels and examination preparation. Access to customers and other aspiring candidates is said to be available on FCMB website with branches where operational desks are currently located, listed. It is part of the Bank’s contributions towards developing a new generation of brilliant minds that would take Nigeria to the next level. The scheme is in partnership with MOD Group, a foremost international education promotion and marketing company with operations deeply rooted in Nigeria and covering the West Africa sub-region. Under the initiative which was launched at a ceremony on May 30, 2018 in Lagos, FCMB is offering a full range of core financial services, tailored to meet the needs of its customers in the area of acquiring education abroad. This is in addition to a wide range of benefits that the Bank is providing for potential and existing students under the Education Advisory Service initiative. Mr. Akanmu also added, ‘’we have Lufthansa Airline, beside other partner airlines on board to offer students, discounted fares under this scheme. This also covers their guardians accompanying them. In addition, we have AXA Mansard coming on board to provide medical cover for the students to the tune of $60,000 a year’’. Also speaking at the ceremony, the Managing Director of MOD Group, Mr. Michael Dosunmu, expressed gratitude to FCMB for the partnership. According to him, ‘’one of the major challenges faced by Nigerians who desire to study abroad is funding and the necessary information to achieve this. We believe that with our partnership with FCMB, through the platform of the Education Advisory Service, this challenge will be addressed. By providing a platform for Nigerians, especially young ones to study abroad, we will be helping to develop a new set of manpower equipped with the required international exposure, knowledge and skills to champion the development of the country. We therefore urge all those who have big dreams for their children and families to take advantage of this opportunity’’. The Permanent Secretary/Tutor General, Ministry of Education in Lagos State, Mrs. Olufunmilayo Onadipe, described the Educational Advisory Service scheme as a step in the right direction. She stated that, ‘’education is the bedrock of any society. For FCMB and MOD Group to come up with this package is an indication that they are committed to providing the necessary support to assist families and our young ones develop academically. I will appeal to FCMB to also accommodate wards from public schools, as they also desire the same foreign education’’. On his part, Head of Communications, British Council, Mrs. Edemekong Uyoh, said, ‘’we consider the FCMB Education Advisory Service as an initiative that would give opportunities for young Nigerians and enhance capacity. The more educated we are, the more we can add value to our lives, economy and the society. At the British Council, we are particular about providing young people with pathways for the future. This is one of the initiatives that also align with our objectives and we are happy to associate with it’’. Also commenting on the scheme, a Representative of the High Commission of Ireland, Tessa Bagu harped on the importance of education. She stated that, ‘’education is the key to the future and development of a country. It is knowledge that drives development. Ireland is one of the leading economies in Europe today because of the high level of education of the people. We are optimistic that through the partnership between FCMB and MOD Group, Nigeria will grow further’’. Leading financial services provider, First City Monument Bank (FCMB), has been awarded the prestigious International Organisation for Standardisation (ISO) 9001:2015 certificate for Quality Management System. The Bank was presented with the certificate by the Standards Organisation of Nigeria (SON), following a comprehensive audit and evaluation exercise conducted by the Organisation. The exercise covered departments and branches of the lender, nationwide. The development is coming on the heels of the renewed strategic focus of FCMB, which has significantly deepened its core values of of Professionalism, Sustainability, Customer Focus and Excellence. Through this process, it was observed the Bank had successfully overhauled and streamlined its processes, procedures and systems to meet best global standards. The ISO 9001:2015 is the most widely used quality management system globally. It provides a framework that ensures that organizations are able to meet customers’ and other applicable requirements consistently. It consists of policies, processes and procedures required for planning and execution that guarantee continuous improvement and operational efficiency in the core business areas of an organization. This helps to mitigate risks, optimise opportunities and the organization is able to deliver better products/ services and sustainable excellent stakeholders experience. The SON audit of FCMB covered key areas including context of the organisation, leadership, planning, support and operation. Others were performance evaluation and improvement. Following this, SON stated in its report that, it discovered that the Bank had put in place and implemented, ‘’good practices, high quality management system awareness and risk/mitigation inbuilt in each process activity’’. It added that the lender also ensured, ‘’adequate evaluation of performance monitoring, measurement, reporting and reviewing against key performance objectives, service provision was under control and customer satisfaction monitored and analysed’’. In his comment at the certificate presentation ceremony on May 16, 2018 in Lagos, the Managing Director of FCMB, Mr. Adam Nuru, described the laurel as another milestone in the commitment of the Bank to attain excellence in all aspects of operations and service delivery. “The award of ISO 9001:2015 certificate is an endorsement of our ability to consistently demonstrate commitment to continuous improvement in order to match the ever-changing needs of our esteemed customers, and in response to market demands and the global dynamics. We regularly ensure the internal appraisal of the risks and opportunities inherent in our business and thereafter take proactive steps to mitigate the identified risks, while optimising the opportunities for the ultimate benefit of our customers, stakeholders and the country’’, he said. While expressing appreciation to SON for the award, Mr. Nuru added that, ‘’this is another proof that the focused execution of our strategic plan, systems, processes and procedures are yielding the desired results and recognition. Our goal is to make FCMB the centrepiece of excellence’’. In his speech, the Director General/Chief Executive, Standards Organisation of Nigeria (SON), Mr. Osita Aboloma, commended FCMB for distinguishing itself as an organisation committed to a culture of continuous improvement, professionalism and best practices. According to him, ‘’this achievement is a demonstration of the Bank’s management system’s conformity to internationally acceptable standard requirements with focus on continual improvement’’. Mr. Aboloma, who was represented by the Director of Standards, SON, Mrs. Chinyere Egwuonwu, added that, ‘’the ISO 9001:2015 Quality Management System approach now provides FCMB a robust, globally recognised and acceptable solution to address the challenges associated with consistently meeting requirements and addressing future needs and expectations of your customers in an increasingly dynamic banking and business environment. The adoption of the latest version of ISO 9001:2015 Quality Management System framework reflects your vision to be the leading financial services Group of African origin. This is an indication of focus on customer satisfaction too’’. First City Monument Bank (FCMB) Limited is a member of FCMB Group Plc, which is one of the leading financial services institutions in Nigeria with subsidiaries that are market leaders in their respective segments. Having successfully transformed to a retail and commercial banking-led group, FCMB expects to continue to distinguish itself by delivering exceptional services, while enhancing the growth and achievement of the personal and business aspirations of its customers. Lagos: April 27, 2018: FCMB Group Plc is on a stronger pedestal and will continue to provide superior performance that would add significant value to stakeholders in a sustainable manner in spite of the challenging macroeconomic and regulatory environments. The financial institution added that its subsidiaries are well positioned to deliver more cutting-edge solutions that would provide the best customer experience in their respective target markets. 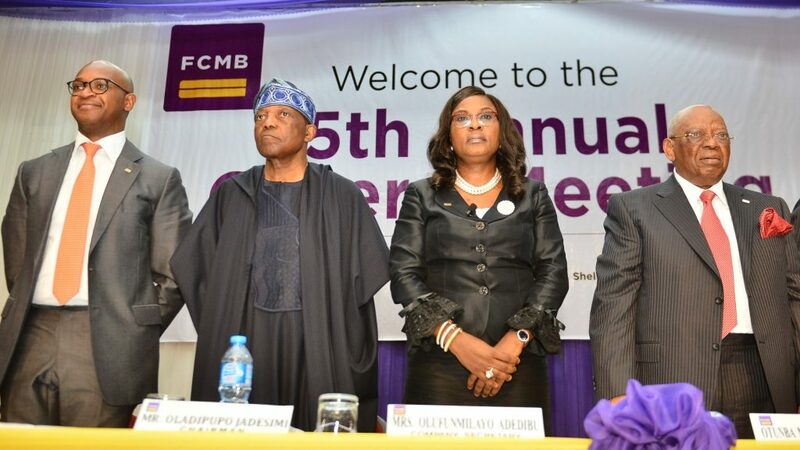 The assurance was given at the 5th Annual General Meeting (AGM) of FCMB Group Plc, a holding company comprising eight entities, namely First City Monument Bank Limited, FCMB Capital Markets, CSL Stockbrokers Limited, CSL Trustees Limited, Legacy Pension Managers Limited, FCMB (UK) Limited, First City Asset Management Limited and Credit Direct Limited, held on Friday, April 27, 2018 in Lagos. Going by its audited accounts for the year ended December 31, 2017, FCMB Group Plc recorded a gross revenue of N169.9 billion and a profit before tax (PBT) of N11.5billion, while profit after tax (PAT) was N9.4billion. In addition, deposits grew to N689.9billion as at the end of December 2017, an increase of 5%, from N657.6billion in the previous year. The Group’s capital adequacy ratio also improved to 16.9% from 16.7%, just as asset base increased to N1.19trillion, compared to N1.17trillion at the end of 2016. Non-interest income as at the end of 2017 was N32billion, while loans and advances stood at N649.8billion. ‘’We will continue to shore up the capital of the bank through profit retention in preparation for the growth opportunities that we expect as the economy recovers’’. ‘’Although we met with a number of challenges as a Group in 2017, I am pleased to say that we were able to surmount them, thanks to the commitment of all the personnel of our Group companies’’. ‘’In spite of the reduction in headline numbers, Group performance is an improvement over the previous year after adjusting for the significant FX (foreign exchange) revaluation income enjoyed in 2016. The key drivers of the Group’s performance include increase in income from our non-banking activities, lower impairment charges from the bank and its subsidiaries, and improved operating efficiencies through more pervasive use of technology’’. “ We see significant growth opportunities in the Pension management industry in Nigeria as it is yet to achieve maturity and will support and facilitate strategic organic and inorganic growth initiatives that will position Legacy in the top-tier of its industry over the next few years’’. ‘’showed signs of improvement with growth in income levels (after adjusting for exceptional FX revaluation income in 2016), reduction in impairment charges and substantial growth in our UK business and consumer finance business (CDL), after a difficult 2016. Commercial and Retail Banking remains our largest group, contributing 76.2% of profits and 98.5% of total assets’’. ‘’Exhibited improved performance, from a loss position in 2016 of N84.0million after tax to a profit position of N430.3million after tax in 2017, largely driven by CSL Stockbrokers Limited. Our stockbroking business remains a top-3 player in its sector and participated as the sell-side broker on the largest ever trade on the Nigeria Stock Exchange in December 2017. CSLS Stockbrokers Limited and FCMB Capital Markets Limited jointly accounted for 4.1% of profits’’. FCMB Capital Markets Limited, the investment banking subsidiary of FCMB Group Plc, has again demonstrated its advisory and capital raising capability by acting as financial adviser and Lead Issuing House on the successful fundraising and listing of LAPO Microfinance Bank Limited’s N3.15 billion bond on the FMDQ OTC platform. The bond, the first ever by a microfinance bank to raise money in Nigeria’s debt capital market, was priced at 17.75% and has a tenor of 5 years. The Issue was rated A- by Agusto& Co and BBB+ by GCR, which are investment grade ratings. LAPO is a leading Microfinance Bank in Nigeria which commenced operations in 2010. Its banking activities are targeted at micro, small and medium enterprises, particularly women and micro enterprise owners who it provides loans to build their businesses. FCMB Capital Markets acted as the Lead Issuing House on the transaction. As a financial adviser, FCMB Capital Markets was responsible for, amongst others, developing a robust transaction structure that ensures flexibility for the issuer and comfort for the investors, and assisting to obtain regulatory approvals. FCMB Capital Markets is one of the few financial institutions in the country to consistently demonstrate the ability to structure transactions of this nature, having successfully executed similar complex deals previously. LAPO Microfinance Bank stated that the proceeds will be used to deepen its business in the country, strengthen its capital base, expand its branchless banking solutions and enter new market segments, including the launch of its agency banking model and the deployment of e-business solutions, among others. Speaking during the bond listing ceremony on Tuesday, March 27, 2018 in Lagos, the Executive Director of FCMB Capital Markets Limited, Mr. Tolu Osinibi, said, ‘’we are excited and grateful at having been given the opportunity by LAPO Microfinance Bank to have played a leading role on this landmark transaction, where FCMB Capital Markets acted as financial adviser and the Lead Issuing House on the first ever bond issuance by a microfinance Institution in Nigeria’s capital markets. The success of this transaction speaks to the institutional strength of LAPO and an affirmation of this strength by institutional investors that have trusted LAPO with the funds they manage. Following from the success of its capital markets debut, we at FCMB Capital Markets expect to see LAPO become a repeat issuer, and we also anticipate that this landmark transaction will open up the capital markets to other microfinance institutions that meet the criteria”. Also speaking, the CEO of LAPO Microfinance Bank, Dr. Godwin Ehigiamusoe, said, ‘’the gap between the demand by micro, small and medium businesses and the little supply is still huge. LAPO Microfinance Bank was only able to deliver loans valued at N135.7 billion in 2017. The capital market remains one of the most viable and affordable options for medium and long term financing for on-lending. We have therefore made a very sound decision. With excellent corporate governance, experienced management, committed staff and extensive footprints across Nigeria, LAPO Microfinance Bank is poised to deliver its core mandate of enhancing financial inclusion. We will continue to enable the under-banked and economically active poor to become active participants in the national economy.’’ FCMB Capital Markets Limited has been involved in several landmark transactions in Nigeria over the past three decades. The firm provides comprehensive advisory services, combining innovative advice and proven execution skills to domestic and multinational clients. Its services include but are not limited to financial advisory, debt and equity capital raising including initial public offerings, mergers and acquisitions, project and structured finance. It has acted as an adviser and arranger of choice to Nigeria’s leading companies and public institutions. 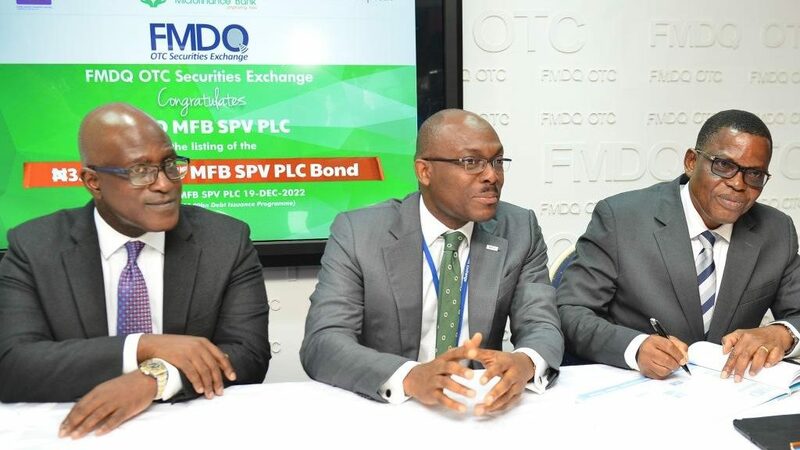 Also, the decision to list the bond on FMDQ is based on the fact that, as a debt-focused securities exchange, FMDQ has shown strong commitment to facilitate growth and development in the financial market through its platform for the registration, listing, quotation and valuation of bonds. The leadership of the exchange continues to run an efficient, transparent and well-regulated market, which attracts and retains both domestic and foreign investors. First City Monument Bank (FCMB) is set to further empower, reward and enhance the experience of its customers through another bumper reward scheme tagged ‘’FCMB Millionaire Promo Season 5’’. This follows the tremendous impact the previous editions of the promo made in the lives of about twenty thousand customers of the Bank who won various gifts, including cars, cash (ranging from N1 million to N5million), refrigerators, phones, decoders, television and power generating sets. In a statement, FCMB explained that the Millionaire Promo Season 5, which runs from March to October 2018,is targeted at all segments of the society, especially existing and potential savings account customers of the Bank. This however, excludes salary and domiciliary account holders. The promo has been designed to provide extra empowerment value to customers of the Bank, reward them for their loyalty over the years, while also encouraging financial inclusion, the establishment of small scale businesses as well as the development of a savings culture. During the promo, various exciting prizes will be won by qualified customers. While four lucky customers of the Bank will each win the star prize of N2million at the grand finale of the promo scheduled for November this year, 12 others will be rewarded with N1million each at the regional draws that will respectively hold in May, July and September. Other fantastic prizes to be won include 160 units of LED television sets, 160 power generating sets, 640 smart phones, 320 tablets and 800 decoders among other consolatory takeaways. On how to participate in the FCMB Millionaire Promo Season 4, all an existing or a new customer of the Bank needs do is to increase his or her balance by N10,000.00 in any of the eligible savings account and maintain it for 30 days to qualify for the Zonal and Regional electronic selection of winners where the star prize of N1million and other fantastic prizes will be won. Multiple savings of N10,000.00 will increase chances of winning. To qualify for the grand finale draws, existing and new customers are to increase their balances up to N50,000.00 and maintain it for 30 days. Multiple savings of N50,000.00 will also increase the chances of winning. Speaking about the Millionaire Promo Season 5, FCMB’s Executive Director, Retail Banking, Mr. Olu Akanmu, said, ‘’FCMB promo is very credible. The draws in the coming season will still take place in all the zones of the Bank across Nigeria. Winners will be emerging from every region, spread across cities, towns and neigbourhoods all over the country. The strength of the FCMB franchise is very remarkable across Nigeria. This accounts for the millions of customers who are doing their savings and banking transactions with us, daily using all our channels. We will continue to reward our customers for their patronage. They are the reason why we are in business and we are poised to continue to serve them with excellent customer experience’’. He urged existing and potential customers of the Bank to take advantage of the huge opportunities the promo offers. The FCMB reward scheme has continued to generate wide appeal across the country since it commenced in 2013. Winners, customers, regulatory bodies and other segments of the society have all commended the Bank for sustaining its empowerment support to the populace. In his testimony, Musa Ele, one of the winners of N2million at the grand finale of the Millionaire Promo Season 4, which ran from March to October 2017, expressed gratitude to the financial institution for being a true partner in progress. He stated, ‘’I am very grateful to FCMB for coming-up with this promo, because without it, I would not have the opportunity to win the N2million. I am very grateful to FCMB and I believe the Bank will continue to help many people’’. First City Monument Bank (FCMB) is a member of FCMB Group Plc, which is one of the leading financial service institutions in Nigeria with subsidiaries that are market leaders in their respective segments. Having successfully transformed to a retail and commercial banking-led group, the Bank has continued to distinguish itself by delivering exceptional services, while enhancing the growth and achievement of the personal and business aspirations of its customers.